Mix 2 tbsp. of sesame oil with sesame seeds, honey and soy sauce. Rub the mixture over salmon filets. Cook asparagus and beans for 4 minutes. Heat 2 tbsp. 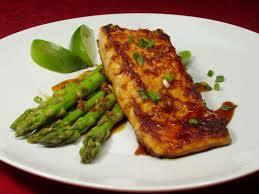 of sesame oil in a pan and cook fish for 3 minutes on each side. Serve fish with vegetables.